The KARBONN A30 has been spotted online at Saholic and is priced at Rs.10,999. And it is indeed a really IMPRESSIVE Smartphone..!! The smartphone sports a 5.9 inch-ed capacitive touchscreen with high resolution and supports dual SIM Mode. It is powered by a 1 Ghz Processor and features the Android 4.0 Ice Cream Sandwich OS. It comes equipped with a 8 MP Rear Camera with Autofocus and LED Flash and a 1.3 MP Front Facing Camera and yes, a 2500 mAh battery. Connectivity wise, it will support Wi-Fi, Bluetooth, 2G and 3G.. There is no info regarding the RAM and the onboard storage specs.. The Karbonn A30 will be available in two colours: Black and White and will be available by 17th December, that is monday. So, who all are up for this smartphone?? 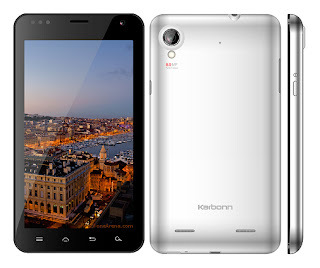 0 Respones to "KARBONN A30 Spotted online; Available for Sale"